Power InterchangeDougal Howard and is possibly out for the game. Dockers InterchangeTanner Smith and is possibly out for the game. Dockers InterchangeLachie Neale off due to the blood rule. Welcome to Domain Stadium for the Fremantle v Port Adelaide Round 13 clash. PORT Adelaide's finals hopes are hanging by a thread after suffering a 17-point loss at the hands of Fremantle at Domain Stadium. The Dockers trailed late in the third term but kicked the last four goals of the match to claim a 12.14 (86) to 9.15 (69) win. Dockers' veterans Michael Barlow and Matthew Pavlich were the chief architects of their third-straight win. Barlow gathered a career-high 43 disposals and kicked two goals while Pavlich bagged four goals on return from a groin niggle. 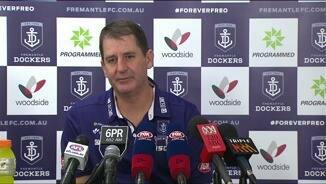 Dockers coach Ross Lyon said Barlow's performance was "very good" and he was pleased with the side's improvement. "I think (it was) a four-quarter effort, really good intensity, our hit around the ball was strong and our possession game was really strong - all stuff we’d been working on over summer," Lyon said post-match. "That's three weeks in a row now so we're pleased with that. There's plenty of improvement to come, but certainly our trademark effort, intensity, and resilience under some adversity at times was pleasing." But Port contributed heavily to its own demise. The visitors led by nine points in time on in the third term after kicking three straight goals. But they butchered three golden opportunities infront of goal before three-quarter time and then only managed three behinds in the final term to lose by 17 points. Port is now two games outside the top-eight with just nine matches remaining. "We just didn't turn up playing hard enough for long enough and we had everything to play for," Ken Hinkley said post-match. "We just couldn’t perform when we needed to. 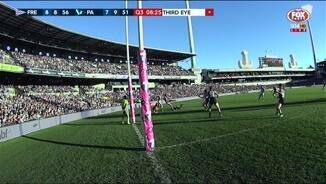 It was like Fremantle were 6-6 and roles were reversed." To blame Port's kicking would undersell the Dockers' performance. The home side won the contested possession count by 29 and had 51 inside 50s to 45 but only had same number of scoring shots. Barlow's performance was simply phenomenal. In just his third game back, after being dropped, he dominated the game and held Port star Robbie Gray to just 18 disposals after running with him for most of the day. Barlow had nine clearances and eight tackles to go with his 43 touches. Lachie Neale provided great support in the midfield with 38 disposals. Hayden Crozier provided great rebound from defence while Connor Blakely had another good performance with 21 disposals. Port had few winners. Chad Wingard threatened to break the game open in his 100th match. He kicked three goals but he butchered three other chances. Brad Ebert kept running all day gathering 28 touches and kicking a key goal in the third term. But Gray, Travis Boak and Ollie Wines had quiet days by their lofty standards. The Dockers' pressure was outstanding all day and aside from three goals on counter-attack in the first term the Dockers scarcely allowed Port to transition quickly from defence to attack. To add injury to insult, sixth-gamer Dougal Howard has suffered a suspected anterior cruciate ligament injury. 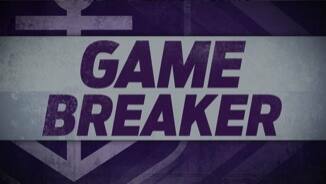 Fremantle: Tanner Smith injured his hamstring while being tackled in the third term. He came off and immediately had ice applied. He took no further part in the match. Port Adelaide: Dougal Howard twisted his left knee in the third term and immediately hobbled off. Port suspect he has suffered an ACL injury and he will require scans. "It doesn't look great for Dougal," Hinkley said. 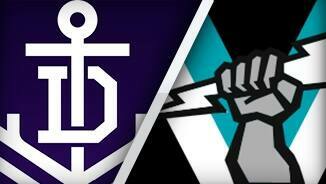 The Dockers travel to Melbourne to face Collingwood at the MCG next Friday night. Port Adelaide has the bye ahead of hosting Richmond in round 15. Fremantle: Pavlich 4, Barlow 2, Ballantyne, Taberner, Mayne, Hill, Weller, Smith. 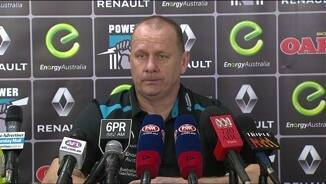 Port Adelaide: Wingard 3, Westhoff 2, Impey 2, Dixon, Ebert. 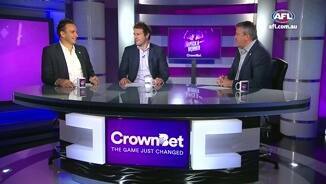 Fremantle: Barlow, Neale, Mundy, Pavlich, Mayne, Crozier. Port Adelaide: Westhoff, Wines, Ebert, Wingard, Trengove, Pittard.